Racin’ Today » Minter: Safer Cars Harming Sport? Minter: Safer Cars Harming Sport? It seems like every time I turn on the TV there’s Tony Stewart trashing the print media. The other night on Jimmy Spencer’s “What’s the Deal?” there was a clip of Stewart referring to one media member as either the dumbest or one of the dumbest of us for asking a question about the safety of the current NASCAR vehicles. It wasn’t a dumb question by any means, and it may have been one of the most pertinent ones posed at Speedweeks. The safety changes made since Dale Earnhardt’s death at Daytona in 2001 have made racing dramatically safer, and that’s a good thing because no one wants to see drivers hurt. But there is a negative aspect to the safety of the cars, and talking about that is anything but dumb. If not for the relative safety of the cars, there would be no “Have At It Boys” approach to officiating the sport. But in the long run, that may be the worst thing that could happen. 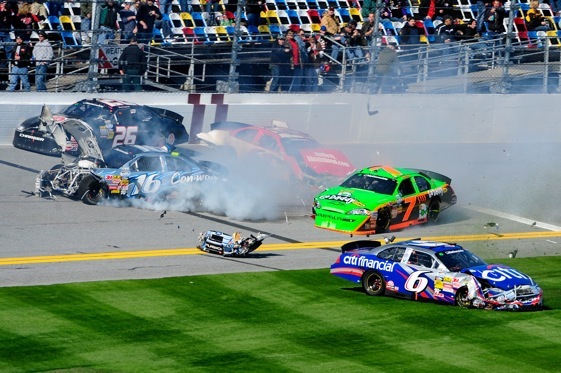 As was evident at Daytona in all three divisions, the racing is gravitating toward something like Demolition Derby at 190 miles per hour. But Demolition Derbies have limited appeal. They’re OK for the annual county fair or as an occasional side show at the local stock car track, but NASCAR can’t rely on wrecking to carry the day with spectators and those watching on TV. There are several reasons it won’t work. For starters, sooner or later someone in the starting field or in the stands is going to get hurt. There was a time, back when the cars weren’t so safe, when a wreck like Dale Earnhardt Jr.’s in the Nationwide race at Daytona would bring about a hushed, concerned silence from the grandstands and from the TV booth. Now a nasty wreck simply becomes more fodder for the highlight films and for promos for upcoming races. But the real problem for the sport is that it can’t rely on wreck-filled races to carry the day. At Daytona, the race was 200 laps. At Atlanta it will be more than 300 laps, and at Bristol and Martinsville 500 or more. They can’t wreck all day at Martinsville or Atlanta, so what is there to hold the interest all afternoon? At some point the sport is going to have to promote itself for what racing really ought to be and that’s driver vs. driver and team vs. team. It’s about strategy and luck and about the rush one gets from seeing a pack of cars accelerating off a corner, heading down a straightaway. It’s about tire wear and weather and the team that adjusts best for the prevailing conditions. It’s about drivers like Jamie McMurray emerging from career limbo to win the Daytona 500 and about Dale Earnhardt Jr. coming from 22nd to second in the closing laps. It’s about a NASCAR pioneer like Glen Wood waving the green flag for the Daytona 500 on his 64th straight trip to Speedweeks and about Michael Waltrip making the cut for the Daytona 500 in the twilight of his driving career and Danica Patrick making a positive impression in her NASCAR debut. Mark Martin expressed it best when he was in the press room during Speedweeks. He was asked about the new green-white-checkered rules, and although he was addressing that specific subject, his answer goes to the heart of the issue. “At this level, I feel that we have to try to hold on to some sort of integrity,” Martin said. His comments also could apply to the way things are getting in the press room, when some drivers are there answering questions, or not answering them. Tony Stewart trashing the media? Say it ain’t so! Great points raised here. The quality of racing on ovals in Indy car events is better because those drivers know what wrecking could mean and that is career ending injury.